Though Korea rap dates back over two decades, its popularity has substantially exploded in Korea quite recently. The current trend of “Show Me The Money,” a nationwide Korean TV rap audition program, proves that. It is not just the rap that encountered the unexpected burst of popularity; underground music in general is also receiving considerable attention from nation’s major entertainment corporations such as SM and YG. It is interesting to see rap’s popularity in a country where its people are overall often considered relatively conservative. Rap music evolved in the U.S. as a means of self-expression for a myriad of issues and problems, tolerating the use of vulgar and explicit language, and Korean rap is no exception. What, then, explains the growing popularity of Korean rap and underground music in general? One explanation is Korea’s thriving underground scene, which, for decades, has been a safe haven for a variety of musicians and performers. Tapping into this invaluable resource is Seoul Community Radio(SCR), which is Koreaʼs first independent radio station for underground artists. It was launched on June 27 this year along with opening of its official website www. seoulcommunityradio.com. Richard Price, the founder of the SCR, states that its mission is to help Korean underground musicians to “reach a wider audience” by giving radio listeners the chance to sample music from the Korean underground, 24 hours a day. Another unique feature of this station is that it also broadcasts a live stream from the set of famous DJs in a video format. 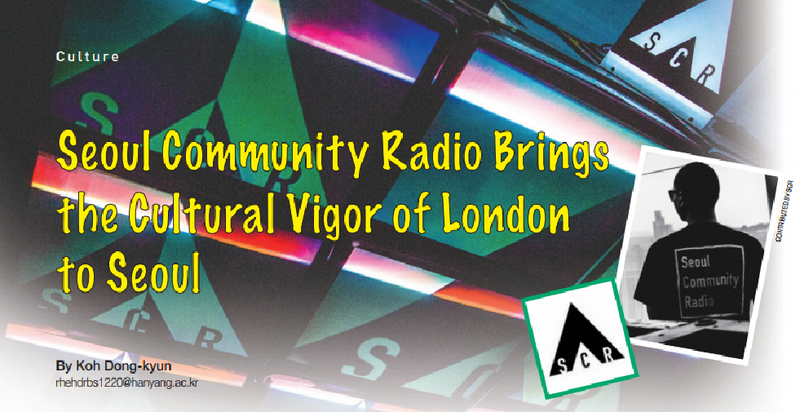 “Radio has been a supportive force for creative communities worldwide. Just as London’s NTS Radio and Rinse FM, SCR aims to help Korean underground talent meet new global audiences and vice versa.” said Price. For all it is doing, Seoul Community Radio is more than a conventional form of radio --it is a multidisciplinary music platform that enables underground musicians to reach out to people in a number of ways, simultaneously. Seoul Community Radio is opening doors for the Korean underground music scene. In fact, it has already gained half a million listeners and 3,351 likes on Facebook in less than two months since its official launch. Considering such popularity of SCR and the growing interest towards rap thanks to the success of Show Me The Money, significant public attention to underground music in general will further be engendered --ultimately diversifying the music scene in Korea. SCR is in role of facilitating that diversification. SCR, as the Korea’s first independent radio station for Korean underground musicians, would be better off if those misconceptions are clarified. Clearance of misconceptions in Korea regarding underground music will not just bring more audiences for Korean underground musicians but engender greater popularity of SCR as well. For underground musicians to make people to listen to their music, people first need to have an interest to underground music. But some of the narratives regarding a particular underground music genre like those above can possibly drive people away from even having slight interest to underground music who might have otherwise been interested. A clear and unbiased narrative about underground music, therefore, provides a fitting working atmosphere for underground artists to focus on their music production. Richard Price also empathizes that underground musicians’ commitment to designing their own style of music is greatly important. “SCR, for a further progress, is in need of talented underground Korean musicians that recognize our mission and willing to work with us.” For such suitable working atmosphere for Korean underground musicians, the clearance of misconceptions and wrong narratives should be preceded. Also, in regard to SCR , less interest in underground music means fewer listeners. Korea is a small but populous country. SCR still has more audiences to reach than the half million it has accrued so far. SCR, as not just the Korea’s first independent radio station for Korean underground musicians but also as one of the profit-oriented companies, carries a necessity to fix misconceptions in Korea regarding underground music. Extending the use of tools that are familiar and maneuverable, such as various SNS platforms including Facebook and Instagram, might also be a good option for SCR to think about. Posting articles, for instance, that introduce rich histories and singular cultural features of underground music and musicians in general is also worthy strategy to consider. Price said that the creation of SCR was inspired by NTS Radio and Rinse FM. SCR also has the potential to be a trendsetter for the Korean underground music scene and for other entrepreneurs who seek to bridge the underground music scene and the general public. As the first independent radio program in Korea designed specifically for underground music, SCR is understandably receiving a lot of attention. This recognition will definitely influence the birth of other radio stations that aspire to be the next Seoul Community Radio. In order for such other radio stations to contribute to the flourishing of the underground music scene and to enhance people’s proper understanding of underground music, SCR’s current approach, policy, and mission statement as a trend-setter and as a source of inspiration are expected to keep up the work it has accomplished so far.